Today is mothersday and I got spoiled by my son. 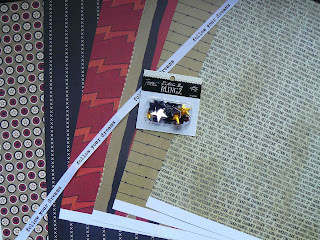 Last week he went to the scrapbookstore nearby with one of his homeschool teachers to buy me some paper and embellishments. I think it's really cool paper! It's from Junkitz and you can use both sides. I also got my breakfast in bed. Two "bolletjes" (soft bread) with chocolate sprinkles (hagelslag), one boiled egg, a glass of juice and a cup of herbal tea. I had to help him a bit with boiling the egg. I told him that the minute the water started to boil he had to put the timer on 5 minutes (we have large eggs). He didn't pay attention to what I was saying and he already started the timer when he lit the fire. After I explained it again he did it right! Being a single mom I always had to help remind my son of these kind of days and help him. But this year one of the teachers (mom of 3 girls with autism) decided to take him to the scrapbookstore to buy me a present. Isn't that just great and thoughtful?! With my new Cricut (LOVE IT!) 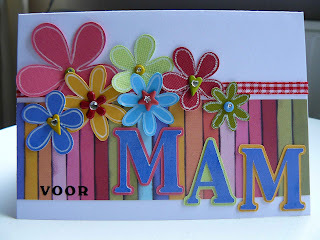 I have made a mothersday card for my mom. 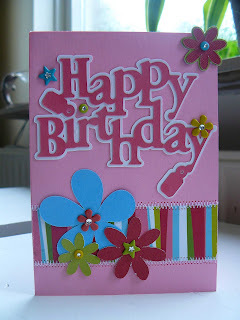 I will pay her a visit this afternoon and bring her this card and another small present. Our family isn't in for big presents on mothers or fathersday. It's the thought that counts! Yesterday, I made a (Cricut) birthday card for my neighbour Esther. She likes to scrap too! 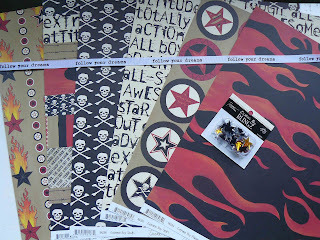 So, I gave her some scrapbook stuff. Great cards! How nice of the other mom to do that with your son! Do you have pictures of other cards or of your Circut machine?